Stanford engineers have developed a tiny, sound-powered chip to serve as medical device to monitor illness, deliver therapies and relieve pain; researchers from the Georgia Institute of Technology and Columbia Engineering have made the first experimental observation of piezoelectricity and the piezotronic effect in an atomically thin material. While medical researchers would like to plant tiny electronic devices deep inside our bodies to monitor biological processes and deliver pinpoint therapies or relieve pain, so far engineers have been unable to make such devices small and useful enough. Providing power to the implants has been one stumbling block, and the use of wires or batteries to deliver power make implants too big, too clumsy – or both. But Stanford engineers are reporting a way to send power – safely and wirelessly – to “smart chips” programmed to perform medical tasks and report back the results, which includes beaming ultrasound at a tiny device inside the body to convert the incoming sound waves into electricity; process and execute medical commands; and report the completed activity through a tiny built-in radio antenna. The chip is powered by piezoelectricity — electricity caused by pressure. Speaking of piezoelectricity, researchers from Columbia Engineering and the Georgia Institute of Technology have reported the first experimental observation of piezoelectricity and the piezotronic effect in an atomically thin material, molybdenum disulfide (MoS2), resulting in a unique electric generator and mechanosensation devices that are optically transparent, extremely light, and very bendable and stretchable. 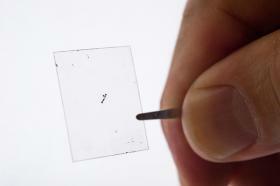 The researchers have demonstrated the mechanical generation of electricity from the 2D MoS2 material. The piezoelectric effect in this material had previously been predicted theoretically. They also asserted that the material, which is just a single layer of atoms could be made as a wearable device, perhaps integrated into clothing, to convert energy from body movement to electricity and power wearable sensors or medical devices, or perhaps supply enough energy to charge a cell phone.